November is here and it is time for a new golf season in Arizona. I am big on asking my students to set goals at the beginning of each season and make a plan to achieve those goals. So, at the beginning of this season, I am going to set a goal of my own. I am going to make the golf swing as simple and easy as possible for all of you to understand. For the vast majority of golfers, the number one thing keeping you from playing better golf from tee to green is a slice, so that is where we will start! The cause of your slice is very simple. Your clubface at impact is open to the path on which you are swinging. It is as simple as that, and nobody can tell you otherwise. Certainly other things can lead to why your clubface is open to your path at impact but this is the only thing that for sure causes a slice. So, once you are clear on that fact we can go about fixing it. Since your issue is one that relates to the clubface, the place you start is the only thing that controls the clubface…your hands and forearms. Again, this is simple. If your forearms do not rotate then neither does your clubface. So what I call Golf 101 is learning how to rotate your clubface. A drill I like to use does not even need a golf club so you can do it anywhere. Take your normal address position and hold your hands out flat (picture 1.). Your arms should be hanging beneath your shoulders with your palms opposing. Now rotate your forearms into the takeaway position. (picture 2). If you are a right-handed golfer your right palm is now facing in front of you and your left palm behind you. Your right palm is not facing the sky because then your clubface would be doing the same thing. 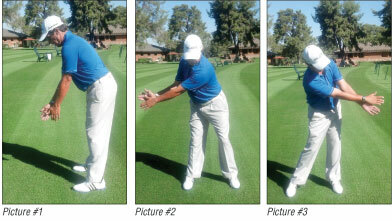 Now, simply rotate your forearms into a follow through position (picture 3). Your left palm should now be facing in front of you and the right palm behind you. If you have done all of this correctly, then you have just learned how to square your clubface during the golf swing and this is the basis upon which everything else will be built. Here is really the thing. You want to get better at golf. That is the reason you pick up magazines and read articles such as this. So, make it as simple as possible on yourself. Don’t waste time changing things that cannot fix your core issue, and if your core issue is slicing the golf ball then you better make sure you can pass Golf 101!